The standard upright is available in heights from 36 inches high to 96 inches high. with heights available up to 120 inches by special order. Compatible with Lozier wall and gondola 4' or 3' wide shelving systems. 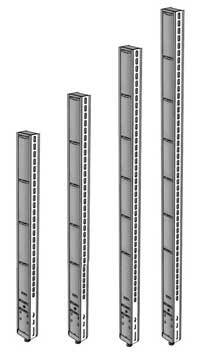 Lozier Extension Uprights are used to extend the height of existing gondola island and wall shelving systems. Along with the extension uprights, backs and a splicer spanner is required to successfully extend Lozier gondola and wall shelving systems. Factory installer connector to fit existing Lozier uprights.